Delhi: Poker is a popular game played by millions of people around the world. Its universal appeal stems from the fact that it is easy to learn, extremely social, provides the opportunity for profit and takes a lifetime of commitment to master. The five-time world champion who famous for his “poker face” on the chess table is one of the most revered names in the world of chess. His involvement has facilitated in bringing credibility to the game, which is widely misunderstood as gambling in the country. This undoubtedly fairs to be the “biggest move ever” made by any brand in the history of Poker. “The whole idea of my association with the league lies in the fact that I find poker no different from chess & through this alliance we are hopeful that we are able to give the sport the long due prominence & acceptance. 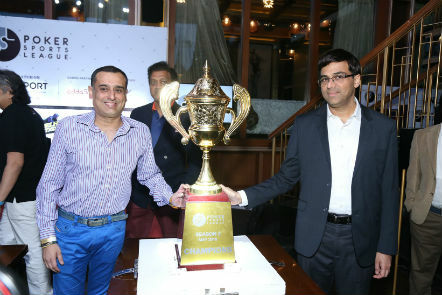 The sport has been internationally acknowledged & recognised & Poker Sports league is an attempt to furnish a platform for the immense poker talent we have in the country”, said Chess icon, Viswanathan Anand while attending a PSL press conference in the capital.